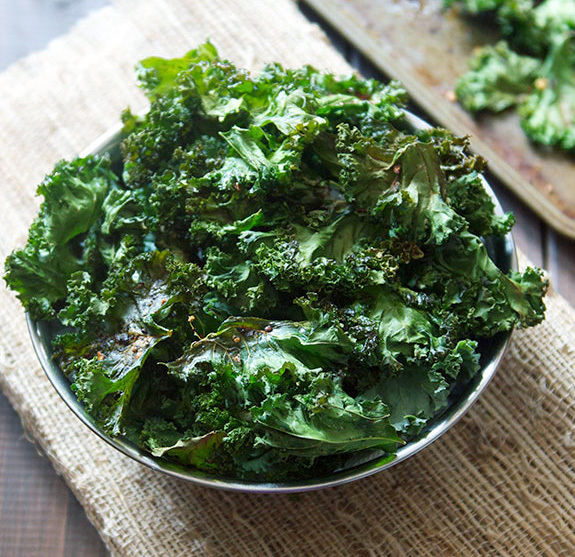 Super Crispy Kale Chips | We Like to Cook! I am a certified chip-aholic. Frankly, no crispy, salty snack is safe in my presence. I am not proud to admit that in my twenties, I was known to make a full meal of a bag of chips and some sort of dip. Of course, at that point I had the metabolism of a hummingbird. Now, not so much. Finding a more suitable alternative to a kettle chip is no small achievement. Rice cakes; ugh. Pretzels; dry and dusty. Nuts and seeds are okay, but missing the satisfying crunch, not to mention the higher fat content. And then there are kale chips. Yeah, I know what you’re going to say, but hear me out. Kale is a super food, plain and simple. It is ranked number one on the Aggregate Nutrient Density Index (ANDI), which ranks foods by the amount of nutrients per calorie. Kale builds better bones with more calcium than milk and is high in magnesium that, along with vitamin D, helps the body absorb calcium. Kale improves your immune system and lowers the risk of chronic illnesses such as cardiovascular disease, arthritis, and blood disorders. 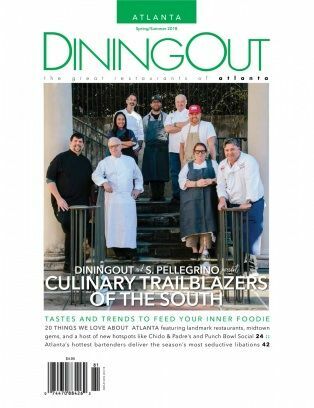 It's low in calories, has zero fat, and is available year-round. Super. Unlike spinach or lettuces, kale is sturdy enough to withstand some heat and still maintain some rigidity making it a good candidate for a chip substitute. 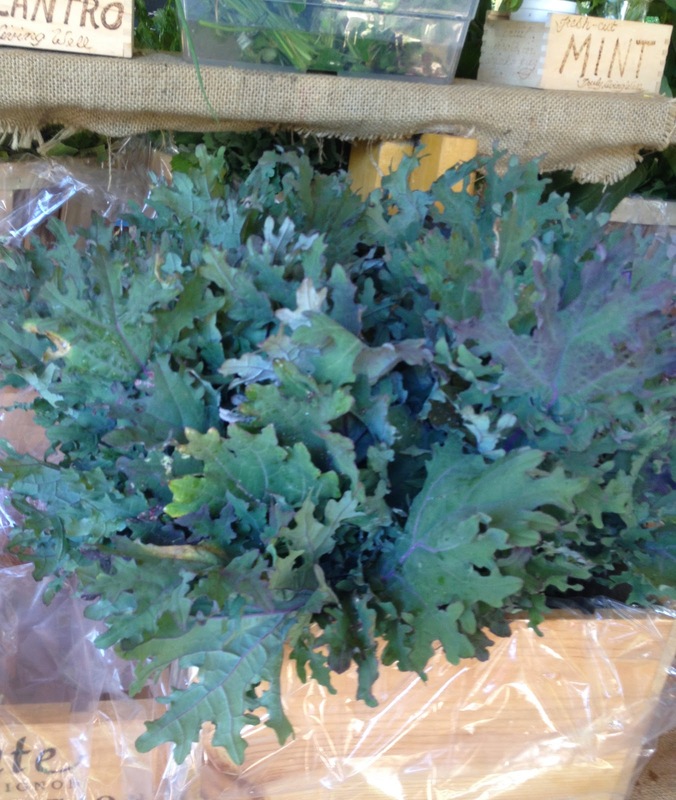 There is, however, an art to making the perfect kale chip, which is preferable to purchasing them. 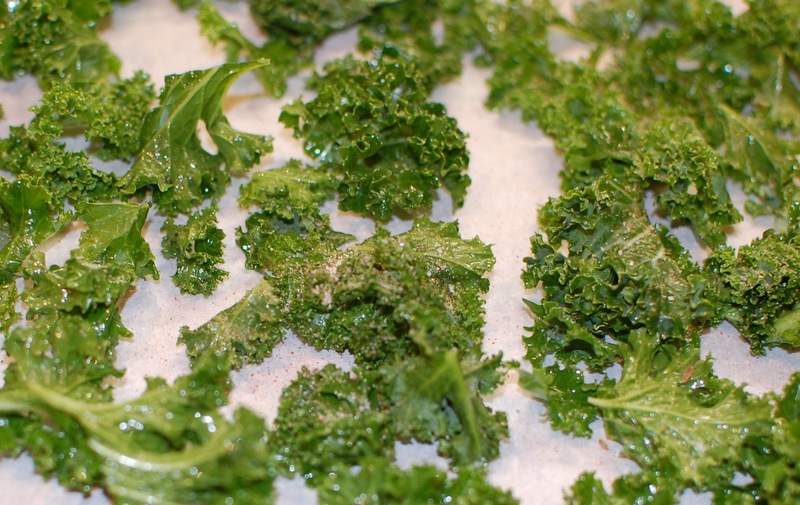 Store bought kale chips tend to be expensive and highly over seasoned. Preheat oven to 300°F. Rinse and thoroughly dry the leaves before beginning. Really dry! A salad spinner works pretty well, but I usually pat them down with paper towels. Remove the stems by grabbing the base of the stem with one hand and pushing outwards along the stem to slide off the leaves. The stems do not cook as fast or thoroughly as the leaves and will retain moisture if not removed. Tear leaves into large pieces. Pour some of the olive oil in your clean hands and literally massage the oil onto the leaves. Work in batches if necessary. It is important to coat the leaves, but not drench them in the oil. Oil prevents the leaves from crumbling and helps the spices stick to the leaves. Avoid adding liquid spices like hot sauce or Worcestershire sauce. Remember dry, dry, dry, dry! Line a large rimmed baking sheet with parchment paper. Place kale on the sheet and sprinkle the spices over the kale and toss to coat evenly. We use the above mix, but you can use your favorite spice mixture instead. Just remember to be judicious in the amount. 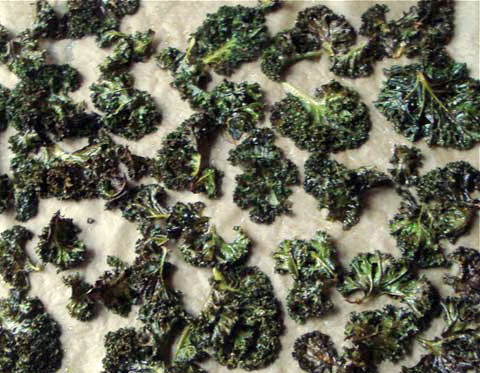 Spread kale into a single layer on the baking sheet to prevent soggy, unevenly baked kale chips. Bake for 10 minutes, rotate the pan, and bake for another 12-15 minutes more until the kale begins to firm up. The kale will look shrunken, but this is normal. Let the kale cool on the sheet for 3 minutes before devouring. This really makes a big difference! Enjoy immediately as they lose their crispness relatively quickly. Store in an airtight container and be prepared to reheat in the oven if they succumb to moisture in the air.